(TibetanReview.net, Dec28, 2016) – The Dalai Lama on Dec 27 spoke to around 300 pilgrims from Tibet attending his three-day teaching in a hotel in New Delhi, telling them that the power of their faith will enable them to receive the Kalachakra initiation he was going to bestow at Bodh Gaya, India, from Jan 2 to 14. Tibetan pilgrims already in Nepal and India have been under strict orders from Beijing to return home immediately or face severe punishment. 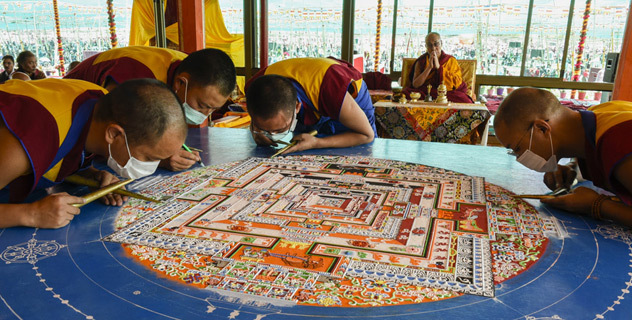 The purpose is to prevent them from attending the Dalai Lama’s kalachakra teaching expected to be attended by around 200,000 devotees. The exiled spiritual leader of Tibet sought to comfort the pilgrims by invoking the power of the bond arising from the strong faith and devotion of the disciple and the visualization power of the guru. “If the Tibetans in Tibet and also the Chinese Buddhists having strong faith and devotion to me wish to receive the Kalachakra Initiation, they can make fervent prayers for it during the main initiation days, ie, Jan 10, 11 and 12, 2017 and I will visualize you all in the initiation mandala and you will definitely receive the empowerment,” voatibetanenglish.com Dec 27 quoted the Dalai Lama as saying. The Dalai Lama spoke to the pilgrims from Tibet in the middle of his three-day teaching to a group from Russia and Mongolia in the Leela Hotel, New Delhi.